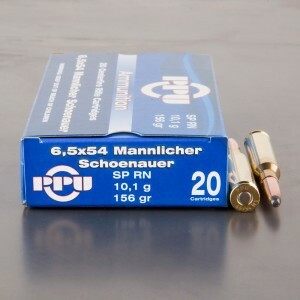 6.5x54mm Mannlicher-Schonauer ammo was born in Austria in the Austrian Arms-Manufacturing Company better known as Steyr Mannlicher in 1903. Its name is derived from its designers: the famous gun designer Ferdinand Mannlicher did the majority of the design while the Steyr plant's general manager and Mannlicher's understudy, Otto Schönauer, designed the incredible rotary magazine. Rotary magazines of course helped to avoid tip deformation. Although offered to armies as a military service weapon, it's probably most famous as a sporting gun.